Lawyer born in South Carolina who made his adult home in Illinois beginning in 1845. He was first a Whig and later a Republican political leader. Military writer Geoffrey Perret described Hurlbut as “a hard-drinking Chicago lawyer.”1 After acting as a investigator for President Lincoln in Charleston before the fall of Fort Sumter in April 1861, Hurlbut became a Union army officer. He was a conspicuous failure as a political general with neither scruples nor ability. He was a frequent correspondent with President Lincoln on civil and military affairs. In compliance with the suggestion made on Thursday last — I left for Charleston on night train of Friday & arrived in the usual course on Sunday morning at 8. A. M. (24th) Col. Lamon who started with me continued company until our arrival at Charleston when we separated he to the Charleston Hotel & I to the house of my sister. We noticed nothing of particular moment on the Road except the activity in preparation & shipment of material of war and projectiles at Richmond for the South. We passed on our down trip two open platform cars fully loaded with shells of 8 and 10 inches – and on our return we met four other cars similarly loaded all bound for the City of Charleston – I noticed at the R R Depot at Charleston eight iron mortars newly landed. On Sunday morning I rode around the City, visiting especially the wharves and the Battery so as to view the shipping in port & the Harbour. I regret to say that no single vessel in port displayed American colours. Foreign craft had their National colors, the Flag of the Southern Confederacy and of the State of South Carolina was visible every where — but the tall masts of Northern owned Ships were bare & showed no colors whatever. Four miles down the Harbor the Standard of the U. States floated over Fort Sumpter the only evidence of jurisdiction and nationality. The Sandy banks of the Islands which form the harbor were lined with fortifications abundantly manned and placed on strong points to command the Channel. I learned from one of the Pilots an acquaintance in former years that the vessels sunk to obstruct the Ship Channel had not had that effect but had been swept out by the force of the current, making but a slight alteration on the Bar. On Sunday night I passed by the Charleston Hotel & was quickly joined by Col. Lamon whose person was still unknown – We went to the residence of James L. Petigru to whom I had the honor of introducing Mr L – By his advice Mr. Lamon, who strongly desired to visit Fort Sumpter [sic] and was provided with a Post office appointment — presented his card to Gov. [Francis W.] Pickens on Monday morning and was kindly & respectfully received. He will report his own acts & observations as I saw him no more from Sunday evening until we met on the train on Monday night. I was at liberty to state to him, that my object was to ascertain and report the actual state of feeling in this City & State. Our conversation was entirely free and confidential. He is now the only man in the city of Charleston who avowedly adheres to the Union. Col. Grayson formerly Collector and in Congress — George S. Bryan — James M. Gray and a very few others stood out in favor of Union until within three weeks, but they have surrendered and at this day Fort Sumpter is the only spot where the U. States have jurisdiction and James L. Petigru the only citizen loyal to the Nation. I also saw many of the leading spirits upon the other side — Wm. D. Porter Prest of State Senate — A. H. Brown, member of the State Convention — Wm H. Trescott & others formerly intimate acquaintances. I saw many representatives of the Mercantile Interest — some heavy Importers & Jobbers, others engaged in forwarding & commission business– Enough at all events to be fair representatives to my mind of their several classes. From these sources I have no hesitation in reporting as unquestionable – that Separate Nationality is a fixed fact – that there is an unanimity of sentiment which is to my mind astonishing – that there is no attachment to the Union – that almost every one of those very men who in 1832 held military commissions under secret orders from Genl [Andrew] Jackson and were in fact ready to draw the sword in civil war for the Nation, are now as ready to take arms if necessary for the Southern Confederacy. Many of them are civil or military officers now. There is positively nothing to appeal to – The Sentiment of National Patriotism always feeble in Carolina, has been Extinguished and overridden by the acknowledged doctrine of the paramount allegiance to the State. False political economy diligently taught for years has now become an axiom & merchants and business men believe and act upon the belief — that great growth of trade and expansion of material prosperity will & must follow the Establishment of a Southern Republic. They expect a golden era, when Charleston shall be a great commercial emporium & control for the South as New York does for the North. Neither is it of any use to appeal to the people — meaning by that term the class of voters engaged in laborious occupations. After Fort Sumter was attacked on April 12 and hostilities broke out, Hurlbut was appointed as a brigadier general in the army – with the support of the same Galena politicians who supported Ulysses S. Grant. They included Congressman Elihu Washburne and businessman J. Russell Jones as well as Senator Orville H. Browning. But unlike Grant, whose support grew and widened with time, Hurlbut’s base of support shrank and narrowed as reports of his drinking, arbitrary behavior and corruption increased. Ironically, Hurlbut was a brave and capable officer in the field but a disaster as a military governor in Missouri, Arkansas, Memphis and New Orleans. Like Grant, Hurlbut succumbed to periodic bouts with liquor. While Grant was a quiet and private drunk, Hurlbut was an obnoxious and public one. Furthermore, he was incompetent. General Grant also used Hurlbut when convenient. Historian Kenneth P. Williams wrote: “On November 9  he had telegraphed to Hurlbut: ‘Refuse all permits to come south of Jackson for the present. The Israelites especially should be kept out.’ This was not really discriminatory, and no one with imagination to picture the situation about La Grange would be bothered by it. But the next day Grant wired to Brigadier Joseph D. Webster, his former chief of staff, now general superintendent of railroads in Grant’s department: ‘Give orders to all the conductors on the road that no Jews are to be permitted to travel on the railroad southward from any point. They may go north and be encouraged in it; but they are such an intolerable nuisance that the department must be purged of them. '”10 President Lincoln himself had to reverse these orders. I believe the War as war is practically over. I think most of the Seceded States will as States offer to return. I think North Carolina, Tennessee & Virginia will consent to gradual Emancipation & probably Louisiana. My duties and responsibilities for the last six months have been peculiarly trying as Commander of this Border Region while at the same time removed from the opportunity for personal distinction. Yet all this and much more I would freely undergo did I believe it necessary. You are aware that I am very comfortably poor, in fact dependent on my profession. I am rapidly losing the faculty of practice and when I return unless it is done soon shall be but a fourth rate lawyer. It appears plain to me that my palpable duty is to return to civil life before I am unfitted for it, as soon as I can be spared. I recognize as thoroughly as any man the advance toward the right made by the adoption of the Free Constitution of Louisiana, and have done and shall do all in my power to vindicate its declaration of freedom, and to protect and prepare the Emancipated Bondsmen for their new status & condition. The fact has been withheld from you, Mr President, but it still exists that nothing has been done for this purpose since the adoption of the Constitution — except by military authority. They are supported, they are clothed they are hired, they are educated exclusively and entirely by the military authorities of the Department of the Gulf, and neither the Executive or the Legislature have done or projected a single thing for their benefit or offered to take this charge off our hands. The Constitutional Declaration cannot act “proprio vigore.” Laws are needed but not made. It is untrue in fact so far as I am concerned or am informed that there exists any hostility toward the state Government of Louisiana. On the contrary were it not for the news papers and an occasional call by me upon the Executive for information I should have no reason to know that such an organization existed. I do not think that any of the Officials have called upon me either for conference or any other purpose since I have been in command. Hurlbut said he hadn’t seen Governor Hahn because Hahn hadn’t come by the general’s offices. He went on to complain about the civilian government in the reconstructed state: “Mr President while I recognize the work of the Constitutional Convention as one of great merit and of vast importance at the time when it was accomplished — it does not follow that I should entertain for the individual members of that body any other sentiments than those which their conduct deserves. Unworthy men are not protected from animadversion as individuals where they deserve it because collectively they have done wise & prudent things. This is the substance of my communication to Genl Canby referred to by you. On taking charge of this Department, it became my duty to report to my immediate commander the state of things as I found it to be. Among other things the immense peculations committed or suffered by the late convention or its agents were forced upon my attention first by the popular out cry; Secondly by the Official Report of the Auditor. Genl Shepley the Mil. Governor had turned over to his successor a full Treasury. It was exhausted by the expenses of the Convention and very much of it for individual gain. This I objected to, and affirm that the men who were guilty of this robbery upon a people in such circumstances, are unworthy of confidence from the authorities at Washington or elsewhere. In short Mr President I do not consider these individuals as either earnest or honest and therefore not to be believed or trusted and this I have reported and still do report of the men thus guilty. President Lincoln was apparently not persuaded by Hurlbut’s excuses. In December 1864, the President appointed a military investigating commission to look into the corruption which Hurlbut had permitted in New Orleans. 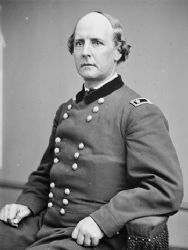 According to Lash, “Although he could have summarily removed him from his Gulf command, Lincoln, probably to appease Hurlbut’s few remaining but still influential supporters in Illinois, sought a legal foundation on which to court-martial him for misconduct and force him from the army. Lincoln undoubtedly recognized an opportunity to remove a strong opponent of presidential reconstruction in Louisiana and a central figure in the army’s cotton ring at New Orleans.”24 Hurlbut was never tried on corruption charges and left the army in June 1865. Hurlbut’s incompetence didn’t hurt his career after the Civil War. After the war, he became the first president of the Grand Army of the Republic and served as U.S. Minister to Peru under President Ulysses S. Grant. He also served in Congress (1873-1877). Jeffrey N. Lash, A Politician Turned General: The Civil War Career of Stephen Augustus Hurlbut, p. 177, 174. Geoffrey Perret, Lincoln’s War, p. 19. Jeffrey N. Lash, A Politician Turned General: The Civil War Career of Stephen Augustus Hurlbut, p. 56. Allan Nevins, The War for the Union: The Improvised War, 1861-1862, p. 47-48. Michael Burlingame, An Oral History of Abraham Lincoln: John G. Nicolay Interivews and Essays, p. 63 (Interview with Stephen A. Hurlbut, May 4, 1876). Jeffrey N. Lash, A Politician Turned General: The Civil War Career of Stephen Augustus Hurlbut, p. 213. Kenneth P. Williams, “Lincoln Finds a General”, III, p. 165. CWAL, Volume VI, p. 358 (Letter to Stephen A. Hurlburt, July 31, 1863). Michael P. Johnson, editor, Abraham Lincoln, Slavery, and the Civil War, p. 229. Abraham Lincoln Papers at the Library of Congress., “Transcribed and Annotated by the Lincoln Studies Center, Knox College. Galesburg, Illinois”, (Letter from Stephen A. Hurlbut to Abraham Lincoln, July 10, 1863). Theodore Calvin Pease, editor, Diary of Orville H. Browning, I, p. 692 (November 14, 1864). CWAL, Volume VIII, 107-108, (Letter from Abraham Lincoln to Stephen Hurlbut, November 14, 1864). Abraham Lincoln Papers at the Library of Congress., “Transcribed and Annotated by the Lincoln Studies Center, Knox College. Galesburg, Illinois”, (Letter from Stephen A. Hurlbut to Abraham Lincoln, November 29, 1864). Abraham Lincoln Papers at the Library of Congress., “Transcribed and Annotated by the Lincoln Studies Center, Knox College. Galesburg, Illinois”, (Letter from Stephen Hurlbut to Abraham Lincoln, March 27, 1861). Abraham Lincoln Papers at the Library of Congress., “Transcribed and Annotated by the Lincoln Studies Center, Knox College. Galesburg, Illinois”, (Letter from Stephen Hurlbut to Abraham Lincoln, August 18, 1863). Michael Burlingame and John R. Turner Ettlinger, Inside Lincoln’s White House: The Complete Civil War Diary of John Hay, p. 74-75 (August 19,1863). CWAL, Volume VI, p. 387. John Cimprich, Fort Pillow, a Civil War Masssacre, and Public Memory, p. 93. Abraham Lincoln Papers at the Library of Congress., “Transcribed and Annotated by the Lincoln Studies Center, Knox College. Galesburg, Illinois”, (Letter from Michael Hahn to Abraham Lincoln, October 29, 1864). Richard N. Current, “Lincoln and the First Shot”, p. 783. Jeffrey N. Lash, A Politician Turned General: The Civil War Career of Stephen Augustus Hurlbut, p. 130. CWAL, Volume VI, p. 387 (Letter of Stephen A. Hurlbut to S.B. Walker).